OFFICE OF COMMISSIONER EUDALY FINAL DRAFT: 2/20/19 30.01.088 Screening Criteria for Applicants for Dwelling Units. A. In addition to the protections set forth in the Act and Sections 30.01.085 and 30.01.087, the following procedures and guidelines apply to Landlords when screening an Applicant for residential tenancy in a Dwelling Unit (as defined in the Act). Definitions. For purposes of this chapter, unless otherwise defined herein, capitalized terms have the meaning set forth in the Act. a. Applicant: An applicant for a Dwelling Unit covered by the Act. b. Supplemental Evidence: Any written information in addition to the application, that the Applicant believes to be relevant to the Applicant’s predicted performance as a tenant. c. Head(s) of Household: Person or persons listed on a lease as the party or parties responsible for paying the Rent. d. ADA Compliant: e. Occupancy Agreement: B. Applications, Generally. a. First-come, First-served. 1. Completed applications must be received and processed on a first- come, first-served basis. 2. All completed applications must be time stamped to indicate the date and time that an Applicant submitted the application (the “Submission Date”). 3. For applications received during an advertised open application period, a Landlord must provide an Applicant with a written or electronic receipt within one (1) business day of the Submission Date that accurately reflects the Submission Date and assigns the Applicant a queue number. 4. A Landlord is exempt from the requirements of this subsection whenever a lottery system or coordinated access system is used to lease up new residential buildings with rent regulations of 80% AMI or lower. b. A Landlord must include the following with every application: 1. Notice to Applicants of the right to request a reasonable accommodation at any point before, during or after the application process; 2. Notice that a Landlord may not deny an application solely because of a reasonable accommodation request or because of the nature of the accommodation requested. 3. Notice to Applicants of their rights under this Section 30.01.088 by including a link to PHB’s website and a printed copy of the notice that PHB creates. 4. A complete description of the applicable screening criteria. 5. An opportunity on the application for an Applicant to indicate their disability status. c. A Landlord may only screen Head(s) of Household. Co-applicants that are not responsible for paying the Rent may be screened for criminal history and rental history (only for violation notices issued to the household for conduct of the coapplicant within the last year that demonstrates they created a hostile, unsafe, or harassing environment for other tenants or engaged in discriminatory conduct), pursuant to procedures and guidelines in this Section 30.01.088. d. May require co-applicants not responsible for paying the Rent to sign an Occupancy Agreement if the household application is approved. e. A Landlord that owns less than fifty (50) Dwelling Units within the City of Portland, may refuse acceptance of a completed application only if the Applicant has a verifiable pattern of Rental Agreement violations with the Landlord and the most recent of such Rental Agreement violations occurred within the last 365 days. f. Any Applicant that self-identifies as mobility challenged on an application within the first 8 hours of an open application period must be given first priority for any vacant Dwelling Unit that is advertised as ADA Compliant. g. Any application received earlier than the advertised open application period will be put in the queue immediately following the first 8 hours. If the Dwelling Unit is advertised as ADA Compliant, and the Applicant indicates as mobility challenged, they will still receive placement preference immediately following any other preference application received during the advertised open application period. D.
Advertisement of Dwelling Units. a. When publicly advertising for specific vacant Dwelling Units, a Landlord must specify an opening date and time when applications will be accepted and cannot accept applications for those specific units outside of the advertised period. b. Except as otherwise prevented from complying due to the format requirements of an advertising service, screening criteria required by a Landlord, or a website address to the criteria, must be included in any public advertisement for available Dwelling Units as well as included on the application. c. Except as otherwise prevented from complying due to the format requirements of an advertising service, all public advertisements must also include if the Dwelling Unit is ADA Compliant. d. When advertising newly vacant Dwelling Units, the open application period must be published at least 72 hours prior to the start of the open application period. Identification. a. A Landlord must accept any of the following as forms of identification, or combination thereof, that verify the full name, date of birth, and picture of the applicant: 1. Valid Social Security Number (SSN Card); 2. Valid Permanent Resident Alien Registrations Receipt Card; 3. Immigrant Visa; 4. Individual Taxpayer Identification Number (ITIN); 5. Non-Immigrant Visa; 6. Any other government-issued identification; or 7. Any other non-government document or combination of documents that would allow verification of identity. b. A Landlord may not reject an application as incomplete due to the lack of a Social Security Number (SSN). c. A Landlord may not inquire about the immigration status of an Applicant or require that any Applicant prove citizenship. F.
individualized assessment as described in Section H if they intend to deny the application based on criminal history. H.
Individualized Assessment. a. A Landlord that chooses not to adopt the threshold criteria as set forth in Section G, must conduct an individualized assessment before denying an Applicant for any criteria they have established. b. Any Applicant that believes that they may have barriers to any advertised screening criteria shall be allowed to provide, at the time of application submission, all Supplemental Evidence they believe provides a positive offset to the barriers. c. A Landlord has an obligation to consider any such Supplemental Evidence submitted by the Applicant including, but not limited to, the following: 1. Six or more consecutive months of job or income stability; 2. Completion of secondary education or job training programs; 3. Current enrollment in secondary education of job trainings programs; 4. Current probation or parole oversight; 5. Certificate of Good Standing; 6. Current payment plan towards credit debt; 7. Completion of Rent Well or another tenant education program; 8. Six or more consecutive months of positive rental payments within the last year; 9. Completion of credit counseling; 10. Current participation in credit counseling; 11. Current participation with a legal or non-profit advocate to clear past collections; 12. Legitimate explanation of lack of verifiable credit history. 13. The presence of domestic violence as contributing factor to rental issues of concern; 14. Current payment plan toward outstanding debts owed previous landlord; 15. Current case management or peer support services; or 16. Any other evidence that the Applicant believes has a tangible impact to the specific barriers identified in an Applicantâ&#x20AC;&#x2122;s history. d. If a Landlord receives the following types of Supplemental Evidence, a Landlord should assume that the presentation of such Supplemental Evidence is a request for a reasonable accommodation under the Fair Housing Act. An applicant reserves the right to use the following information as a request for Individualized Assessment as well: 1. Completion of drug or alcohol treatment; 2. Current enrollment in a drug or alcohol treatment program; 3. Completion of psychological counseling; 4. Current participation in psychological counseling; or 5. Current case management or peer support services related to disability or mental health. e. In addition, a Landlord must consider the information from the individualized assessment and Supplemental Evidence in light of the following before denying an Applicant: 1. The nature and severity of the barriers; 2. The number and type of the barriers; 3. The time that has elapsed since the date the barriers occurred; and 4. The age of the individual at the time the barrier occurred. Appeals a. 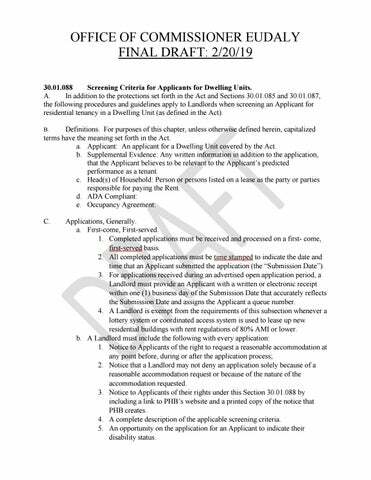 An Applicant that is denied for residential tenancy by a Landlord using the threshold criteria as described in Section G must have the opportunity to appeal that denial directly to the Landlord based on: 1. Incomplete or inaccurate information identified during the screening process, or 2. Additional supplemental evidence. b. An Applicant must be allowed 30 days, from the date the denial was issued, to request an appeal and submit all evidence related to the appeal. c. A Landlord is not required to hold the Dwelling Unit for the Applicant during the pendency of the appeal process. d. If the appeal results in the denial being overturned, a Landlord must give the Applicant preference for future vacancies on the same property (with similar screening criteria and similar income ratio) if they apply within the first 4 hours of an open application period, for up to 3 months from the date of the original appeal determination. 1. If a denial is successfully appealed, a Landlord must provide a dated letter, signed by the Landlord, documenting the successful appeal that includes specifics about which properties qualify for the preference. 2. An Applicant who receives a letter of a successful appeal must attach that letter to future applications with the same Landlord to receive preference, for up to 3 months from the date of the original appeal determination. 3. An Applicant who successfully appeals a denial cannot be charged a screening fee for future applications with the same Landlord, for up to 3 months from the date of the original appeal determination. 4. If more than one Applicant provides a letter of a successful appeal during an open application period, the Applicants will receive preference in order of the dates on the letter, with oldest date getting first preference. 5. If there is a conflict between an appeals preference and an accessible unit preference as described in Section C, the accessible unit preference is first, only superseded by an Applicant with both an accessible unit preference and an appeals preference. 6. If an Applicant applies with an appeal preference, the Landlord may require the Applicant to self-certify that no conditions have changed since their original application. e. A Landlord has the discretion to also maintain a wait list and contact preference applicants (in the order their appeal letter is dated), before advertising a vacant Dwelling Unit to the general public. Denials-General a. An application can be denied without a Landlord first conducting an individualized assessment when an Applicant does not meet basic criteria requirements such as incomplete application, identification, income, or an Applicant has purposefully withheld or misrepresented required information. b. If an Applicant applies as part of a family or group, a Dwelling Unit can be denied to that Applicant individually but not the family or group as a whole unless they no longer qualify for the income ratio or occupancy standards. a. When denying an application based on threshold criteria as described in Section G, a Landlord must provide a written “Notice of Adverse Action” compliant with ORS……..to the Applicant within two weeks of the denial. b. A Notice of Adverse Action can be provided to the Applicant by either a Landlord or a screening company. c. A second denial after an appeal as described in Section I can be written in a manner at the discretion of the Landlord. L.
Denials-Individualized Assessment a. When denying an application after performing an individualized assessment as described in Section H, a Landlord must provide a written “Notice of Denial” to the Applicant within two weeks of the denial that includes: 1. The specific adverse information that matches the screening criteria information as provided with the application, including detailed information received from a rental reference if it is the basis of the denial; 2. The Supplemental Evidence, if any, that the Landlord considered and whether it influenced the decision of the Landlord to deny the application; 3. An explanation of the legitimate, non-discriminatory business interest of the Landlord that justify denial of the application, and how the Supplemental Evidence provided did not address the interest. b. A Notice of Denial can only be issued to the Applicant by the Landlord. Additional Deposit. a. A Landlord may request an additional security deposit as set forth in Section 30.01.087 as an alternative to issuing a Notice of Adverse Action or a Notice of Denial. b. To request an additional security deposit, a Landlord must provide a written “Notice of Conditional Approval” to the Applicant that contains the same information as required in a Notice of Adverse Action or a Notice of Denial (depending on the screening process used) and additionally contains the specific amount being requested as well as the ability for an Applicant to choose a payment plan as set forth in Section 30.01.087. c. If a Landlord requests an Additional Deposit as a condition of offsetting a low income ratio, the Landlord does not need to issue a Notice of Conditional Approval but must follow the code as set forth in Section 30.01.087. Screening Fees a. A Landlord must return a screening fee, or communicate approval or denial of residential tenancy, to an Applicant within two weeks of the final determination of the application. b. If using a professional screening company exclusively, the screening fee charged by the Landlord cannot be more than what is charged by the screening company. c. If using a professional screening company in addition to screening work by the Landlord, fees cannot exceed 25% above what is charged by the screening company. 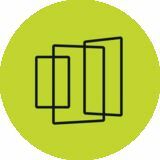 d. If a Landlord screens independently without the use of a professional screening company, fees cannot exceed 10% above what is charged by the average professional screening company in the Portland-Metro area. a. An Applicant that experiences disabilities cannot be denied housing based on a denial of reasonable modification alone. b. If an Applicantâ&#x20AC;&#x2122;s modification request is denied, the Applicant must be allowed 24 hours to request an alternative modification that meets their needs. c. If the second modification request is denied, the Applicant must be allowed another 24 hours to request an alternative modification that meets their needs. d. If no reasonable modification can be made in the Dwelling Unit the Applicant applied for, then the Applicant may still accept the Dwelling Unit if they meet the eligibility criteria. P.
Exemptions. a. Any Dwelling Unit that is subject to a partnership or referral agreement between a Landlord and a non-profit service provider or government agency working to place low income or vulnerable tenants into housing is exempted from this Section. b. Any Dwelling Unit not rented or advertised to the general public, (including online platforms with or without a fee), are exempted from this Section. c. Any Dwelling Unit otherwise complying with state or federal loan or funding requirements is exempted from the parts of this Section in conflict with the loan or funding requirements. d. Any Dwelling Unit shared with a Landlord or sub-leaser as their primary residence is exempted from this Section. Damages. a. Any Applicant claiming to be aggrieved by a Landlordâ&#x20AC;&#x2122;s noncompliance with the foregoing has a cause of action in any court of competent jurisdiction for Damages and any such other remedies as may be appropriate. Unit along with the depreciated value of each item at the time of move-in (the “Commencement Date”). D. Within one week of the Commencement Date, a Tenant may complete and submit to the Landlord, a condition report (on a form provided by the Landlord) noting any and all damage in the Dwelling Unit (the “Condition Report”). If the Tenant submits a Condition Report to the Landlord within one week of the Commencement Date, such Condition Report shall be the proof of the condition of the Dwelling Unit on the Commencement Date in order to assess damage beyond reasonable wear and tear at move out (the “Termination Date”). If, after the first week, the Tenant has not completed a Condition Report, a Landlord must complete a Condition Report and provide a copy to the Tenant. Any damages noted in the Condition Report completed by the Landlord upon move-in must also be documented in photographs and provided to the Tenant. If any damage noted in the Condition Report, is subsequently repaired, the Landlord must revise the Condition Report to reflect such repair, have it initialed by the Tenant, and provide a copy of the revised Condition Report. If either party disagrees with any damage noted on the Condition Report, they must write the nature of their disagreement on the Condition Report, initial, and provide a copy to the other party. Within one week of the Termination Date of which the Landlord had notice, the Landlord shall conduct a walk-through of the Dwelling Unit to document any damage beyond ordinary wear and tear not noted on the Condition Report (the “Final Inspection”). A Tenant, and/or the Tenant’s representative, has the right to be present for the Final Inspection, but may choose not to participate. The Landlord must give notice of the date and time of the Final Inspection at least 24 hours in advance to the Tenant. Any damage for which a Landlord intends to withhold a portion of a Tenant’s security deposit must be documented in writing and include proof of depreciated value for movable property in the Dwelling Unit including, but not limited to, original receipts or demonstration of a similar make and model, and visual damage must be documented in photographs and provided to the Tenant at the same time as the written accounting required under ORS 90.300 (12). To the extent that a Landlord seeks to charge labor costs greater than $200 to a Tenant, the Landlord must provide documentation demonstrating that the labor costs are reasonable and consistent with the typical hourly rates in the metropolitan region. A Landlord may not charge for damage noted on the Condition Report. E. Within 2 weeks of receipt of a security deposit, a Landlord must deposit the money in a separate checking, savings, money market, or client trust account and provide the bank institution name and account number in writing to the Tenant. If the account bears interest, the Landlord is required to pay such interest in full, minus an optional 5% deduction for administrative costs, to the Tenant unless it is used to cover any claims for damage. For interest bearing accounts, the Landlord must provide a receipt of the account and any interest earned at the Tenant’s request, no more than once per year. A Landlord may pool multiple security deposits in a single account so long as the account is separate from the Landlord’s personal funds, is not accessed except to deposit and withdraw Tenant deposits, and Landlord can provide an individual accounting of each Tenant deposit and the interest earned thereon. A landlord shall have six (6) months from the effective date of this Subsection to comply with the requirements of this Subsection. F. Contemporaneously with the delivery of the written accounting required by ORS 90.300 (12), the Landlord must also deliver to the Tenant a written notice of rights regarding security deposits (“Notice of Rights”). Such Notice of Rights must specify all of Tenant’s right to damages under this Section. The requirement in this Section may be met by delivering a copy of this Section to the Tenant along with contact information for the nearest Legal Aid Services of Oregon office or the Oregon State Bar. G. Within 5 business days of receiving or giving a notice of any kind that terminates a tenancy, a Landlord must provide a written accounting of the Tenant’s Rent payment history that covers the tenancy for the term or the prior two years, whichever is longer. Within 5 business days of receiving or giving a notice of any kind that terminates a tenancy, a Landlord must provide a completed Rental History Form as provided by PHB. H. A Landlord that fails to comply with any of the requirements set forth in Section 30.01.87 shall be liable to the Tenant for the security deposit, a penalty in the amount equal to two times the security deposit, as well as attorney fees and costs (collectively, “Damages”). Any Tenant claiming to be aggrieved by a Landlord’s noncompliance with the foregoing has a cause of action in any court of competent jurisdiction for Damages and any such other remedies as may be appropriate.